Movement toward Obama in nearly every national poll released today. Latest USA Today/Gallup poll of 12 swing states shows a tie. Romney held a four point lead a month ago. 18 new swing state polls today so far. Romney leads in just 4. But Ryan’s biggest boosters realize he probably can write his own ticket, win or lose on Nov. 6. These Ryan allies spoke on the condition of anonymity to discuss private proposals they were preparing for him. They insist Ryan is not worried about anything beyond the election and is not planning anything except being a governing partner to Romney. It’s no accident he embraces the “wonk” label aggressively. It could make him an attractive figure as a guest lecturer or visiting professor. Or Ryan could set up an office at a Washington think tank and focus on issues that interest him. That would give him a platform to shape public policy without the frustrations of electoral politics. “If you hadn’t had the storm, there would have been more of a chance for the [Mitt] Romney campaign to talk about the deficit, the debt, the economy. There was a stutter in the campaign. When you have attention drawn away to somewhere else, to something else, it is not to his [Romney’s] advantage,” Rove told The Washington Post. “Obama has temporarily been a bipartisan figure this week. He has been the comforter-in-chief and that helps,” Rove said. The slight disadvantage for Obama, Rove said, “is that people in Eastern coastal communities are going to be preoccupied by issues of getting food to eat and having a roof over their heads; some of them won’t be thinking as much about the election.” But he conceded that those people reside in the Northeast, and not in the battleground states most likely to decide the election. Campaign sources concede superstorm Sandy stalled Romney’s momentum. For eight straight days, polls showed him picking up support. The campaign’s internal polling, which is using different turnout models than most public polls, had him on solid ground in Florida, Virginia, North Carolina and Iowa. He had a slight lead or was tied in Ohio, New Hampshire and Wisconsin and was in striking distance in Pennsylvania, a state Republicans hadn’t won since Ronald Reagan in 1984. Coming off the pivotal first debate, the campaign pushed the message that the 2008 Barack Obama of hope and change had become the 2012 President Obama of divide and destroy, making the campaign about small things — Big Bird and binders — at a time the nation had big challenges. It resonated with voters in those swing states. Those leads in Florida, Virginia, North Carolina and Iowa still hold in the internal polls, campaign sources say, but Romney’s movement flattened out or, as the campaign likes to say, “paused.” Nevada is now off the table, and those neck-and-neck swing states are even tighter. (CNN) – Former Mississippi Gov. Haley Barbour on Sunday argued Superstorm Sandy not only wreaked havoc on the Northeast this week, but blunted Mitt Romney’s campaign as well. Barbour, a Republican, said the barrage of news coverage surrounding the storm replaced the political debate in the final days leading up to the election. He added, however, he doesn’t blame the media for covering the storm. “Any day that the news media is not talking about jobs or the economy, taxes or spending, deficit and debt, Obamacare and energy, is a good day for Barack Obama,” he continued, adding the news “blackout” on those issues has helped the president. “Whether it will be good enough remains to be seen,” he said. DOWD: …every time you feel a losing campaign, these three things happen. The first thing happens is, don’t believe — the public polls are wrong. That’s the first sign of a campaign that’s about to lose. The second thing, we’re going to change the nature of the electorate, and you’re not seeing it reflected in the polls. And the third thing is, the only poll that counts is Election Day. When you hear those things, you know you’re about to lose. Bottom line: if your side is preemptively making excuses or telegraphing the running mate’s backup plans before the election, odds are you’re going to lose. I’ll publish my pre-election predictions in the next day or two. Update: From Nate Silver: Between national + battleground state polls so far today: 29 Obama leads, 3 Romney leads, 5 ties. 8:52 – Raddatz just referred to Paul Ryan as “Congressman Ryan” from the stage. Did she just violate the terms of the debate? 8:58 – For your amusement, follow Onion Politics on Twitter tonight, who will be tweeting in character as Joe Biden as only they can. 9:06 – Ryan points out that the US ambassador in France has marines guarding him. Shouldn’t US ambassador in Benghazi have had a marine detachment guarding him? 9:11 – Biden on administration’s initial story about protest: Intelligence community told us that… they learned more facts and changed their assessment. 9:12 – Raddatz to Ryan: Should US apologize for burning Korans, urinating on corpses. Ryan – Yes. For urinating on corpses. Not for US values. 9:14 – Good/tough question from Raddatz for both candidates: How effective would a military strike on Iran be? 9:18 – Ryan hits Obama for going on The View while in New York City but not meeting with Benjamin Netanyahu. 9:19 – 20 minutes in, purely from an optics perspective, Biden looks like he’s having more fun with the debate than Obama. 9:23 – Raddatz pivots to the economy. 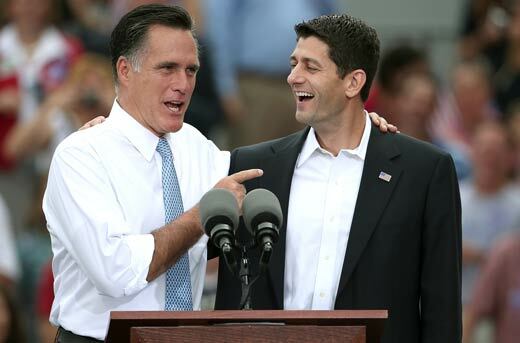 9:24 – Biden hits Romney for “Let Detroit Go Bankrupt” op-ed and 47 percent comments. 9:26 – Ryan asks Romney about the unemployment rate in his hometown of Scranton, Pennsylvania. 9:28 – Ryan telling story of Mark Nixon, family in MA helped by Romneys after two of his children paralyzed in a car accident. 9:37 – Biden mentions Sarah Palin and death panels in rebuttal to Paul Ryan’s opening response. Fact check: Palin’s death panel comment came in 2009, AFTER the Obama administration was in office. 9:40 – Some pretty contentious back and forth going on, as Ryan and Biden speaking over and interrupting each other. 9:45 – Raddatz moves on… next question is on taxes. Who will pay more or less in taxes? 9:55 – Raddatz pivots to defense spending. 9:57 – Raddatz pivots to Afghanistan. Why not leave now? What more can we accomplish? 10:07 – Are they arguing about Afghan weather and geography? 10:08 – Raddatz pivots to Syria… Why no military action in Syria? 10:12 – Watching the clock… Biden has spoken a full 3 minutes more than Ryan. 10:13 – Ryan: We should not have called Bashar Assad a reformer. We should not have waited for Russia to give us the green light at the UN. 10:14 – Raddatz asks Biden and Ryan – both Catholics – what role religion plays in their views on abortion. Biden says he accepts church teachings that life begins at conception personally, but won’t impose it on others. 10:22 – Raddatz closing question: What would you say to American hero about this campaign? Ever embarrassed about the tone? 10:24 – Ryan: You had a president run on hope and change 4 years ago who now campaigns on attack, blame and defame. 10:29 – Closing statements… Biden goes first. 10:32 – That’s a wrap. Now onto the Spin Room and post-debate coverage!